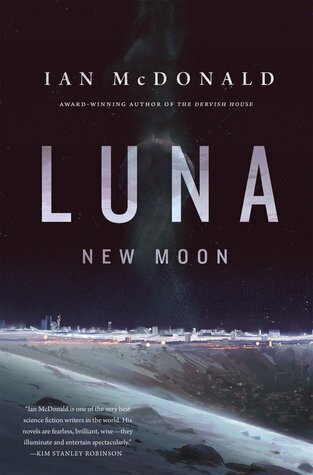 Luna: New Moon is Ian McDonald’s latest sci-fi novel, a thriller set on a moon where everything is for sale, and everything has a price – including the air you breathe. I first ran into McDonald’s thoroughly corporate Luna in a short story, in one of Jonathan Strahan’s “Best of Science Fiction…” anthologies. It’s an unforgiving environment, one in which the smallest mistake can kill, and where life is both entirely artificial and extremely fragile. McDonald gives the reader a moon which feels a lot like the depths of the ocean – and then adds mineral riches, and a frontier feel. This is an unfriendly place, brought to life by the people who live, work, and die on it. And those people, at least the ones we see, are pragmatists, corporate raiders, wage slaves and founders of dynasties. Because McDonald’s moon has dynasties – the wonderfully named ‘Five Dragons’, each controlling a vital part of the moon infrastructure, or selling a valuable resource to the Earth that soars overhead. And with dynasties, there’s politics, and family drama, a microcosm of humanity being played out in pressurised bubbles – war and peace in a world which will eliminate the unwary without a qualm, and reward those that risk all and survive. The original short story looked at the origins of the youngest of the large Luna corporations, the Corta – who became specialists in Helium3 mining. The novel follows up from that story, shifting the narrative forward in time; the original young protagonist is now the family grandmother, the ancient regime, as it were. Her daughters, sons and grandchildren give us our view onto the world of Luna, a corporate aristocracy. There’s the analytical, driven son – and his more emotional, less focused brother, given to swift rages and swifter laughter. There’s the sister who serves as a divorce lawyer – in a court where everything, including the judges, is negotiable, and trial by combat is a last resort. There’s the odd son, the one partially outside the collective, who meshes with a strange collective of outsiders. They all leap off the page at the reader, filled with complexity, and emotional truth. They may not be particularly pleasant examples of people, but they do feel genuinely human. McDonald also gives us a view from the bottom. In a world where food, water, air and bandwidth are all billable, there’s room for an underclass. For people educated enough to make it to the moon, but unfortunate enough to be unable to stay. Our view here is given by Marina, who begins the narrative unemployed and rapidly running out of air, takes a job as a waitress at a Corta party – and has a larger impact on the high-flying dynastics than they might expect. Marina is our every-woman, someone outside the social structures, confines and freedoms of the corporate structure – she’s not the only viewpoint character, but perhaps the easiest to empathise with. Much like the others, she’s given her own voice, and feels like an individual, rather than a character. Between the starkly lethal beauty of the environment, the carefully crafted society where everything is a matter of contract, and the feuding dynastic families, the plot really writes itself. It starts with an assassination attempt, and rarely lets up from there. There’s a wonderful strain of mystery running through the narrative, as well as some carefully crafted strands of family conflict, which had me by turns chuckling at their familiarity and gasping at their consequences. No more for fear of spoilers, but McDonald manages to set up a multi-layered plot, a fusion of family dynamics, character pieces and sweeping action pieces, and bring the whole together seamlessly. It was very, very hard to put this book down. I would say that the end is clearly a set up for the forthcoming sequel – but it’s very well done. Overall, it’s a really good read – the environment is convincing, the characters wonderfully flawed and entirely believable, and the plot well-paced and gripping. It’ll draw you into its world and refuse to let you out again. If you want to try an innovative piece of sci-fi, with a lot to say and a good means of exploring ways to say it, then this is the book for you.